METICULOUS CARE: Exhaustive efforts go into the vital work of central sterile processing, but few truly understand how much. The challenge is obvious--pathogens are tiny and they hide everywhere. The goal is 99.999% elimination, so only a thorough approach works. 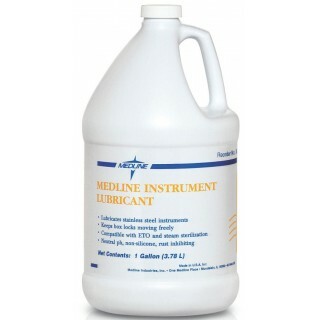 Medline Instrument Lubricant: Protect your investment and prolong instrument life with lubricants that prevent rust and corrosion. Protects all types of metal instruments, including carbon steel. Non-silicone, patient-safe lubricant keeps box locks working freely and maintains effectiveness of grasping and cutting surfaces. 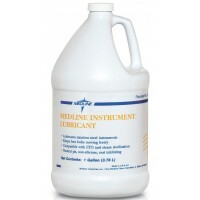 Protects all types of metal instruments, including carbon steel. Will not interfere with steam or gas sterilization. Keep box locks working freely and maintain effectiveness of grasping and cutting surfaces with this nonsilicone, patient-safe lubricant. Wont interfere with steam or gas sterilization. Dilution Ratio 1/2 oz: 1 gl, Ready To Use.